Alcohol is a major cultural staple. Beer, wine, and spirits are consumed at celebrations and commiserations alike, enjoyed for their relaxing and confidence-boosting effects as much as their flavors. Unfortunately, these effects do not come without their downsides. As much as drinking alcohol is legal, popular, and - if consumed responsibly - safe, alcohol can significantly impair cognitive functions in the brain: slurred speech, dulled reactions, and memory loss can all occur as a result of intoxication. These effects are dangerous and, in cases of regular intoxication or alcoholism, could have a long-term impact on the brain. It's helpful to clarify the recommended alcohol intake for adults to understand what exactly constitutes “binge drinking”. Three alcoholic units equates roughly to one large glass of 12%-ABV (24 proof) wine, or just over a pint of 4%-ABV (8 proof) beer. Drinking four or more drinks in an hour far exceeds the recommended dosage, and is known as binge drinking. Consuming alcohol at this rate raises blood alcohol levels at a quicker rate than the body can metabolize, causing intoxication to occur. This inhibits the brain's ability to form new memories, though it does not affect memories formed prior to intoxication. This means that, once sober, a person may not be able to recall details or entire events experienced while intoxicated, known as a blackout. This can be dangerous for a number of reasons, not in the least because intoxication increases the likelihood of sexual promiscuity, involvement in violence, and driving while under the influence. Studies have found the majority of binge drinking blackouts occur when liquor (e.g., vodka, rum, and whiskey) are consumed in excess. 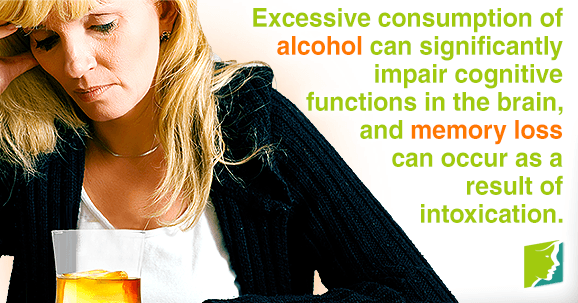 Alcoholism is the medical term for alcohol dependency or an alcohol addiction. This can create a number of physical and social issues, such as liver damage and estrangement from loved ones, as well as physiological ones. Liver cirrhosis is widely understood to be common in alcoholics, but what's less known is that the disease can also lead to brain disorders like hepatic encephalopathy, which affect memory, mood, and personality. Around 80% of alcoholics also develop thiamine deficiency as a result of poor nutrition, which can lead to memory-affecting brain disorders, including the potentially fatal Wernicke-Korsakoff syndrome. Enjoying alcohol is enjoyed in moderation is perfectly acceptable; a glass of wine can help to unwind after a long day, and drinking a pint of beer with friends is fun. When blackouts occur, loved ones express concern, or your alcohol consumption is affecting your professional, private, or social life, however, it's time to assess your drinking habits before any further physiological or emotional damage is done. Go with a family member or friend to consult your doctor for advice about cutting down and the support options available for you. Discover the various causes of memory lapses and the difference between normal forgetfulness and more serious conditions.